The staff and service are excellent. The bed was fairly comfortable and the facilities served the purpose for our very brief stay. Attractive Apartments near the beach Our stay was too short for an wedding but room and bed were comfortable and had every facility . Roaches Run down and dirty. Cockroaches. Need I say more? Staff were excellent. Motel not. 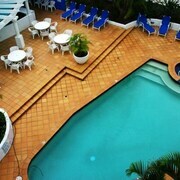 Long weekend Villa at Miami had a great view. Very basic inside but. Little overpriced. Air con and fan in main bedroom but no reading lamps. Second bedroom small but had no fan no air con but yes did have reading lamps. Was a little noisy at times as you are right on top of the carpark to the beach. 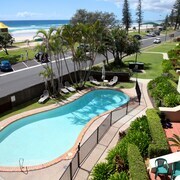 Great stay Great appartment close to beach and pool which is great for kids. Tired of hearing about KPIs and ROIs when you'd rather be unwinding somewhere with a couple of G&Ts? Escape the office (and all that annoying jargon) and book a hotel in Miami. 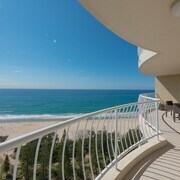 You'll locate it 6 kilometres from the heart of Gold Coast. Sure, you could spend your whole break doing nothing but sitting around with your feet up and a refreshment in hand, but you'd be seriously missing out. Gold Coast boasts a few big-name sights, like Sea World, Dreamworld and Warner Bros. Movie World. You've gotta see them! Grab your camera, hat and sunnies, and make your way to Burleigh Beach for a day of fun in the sun. At the end of a busy day, kick back and chill at a seriously comfy hotel nearby. 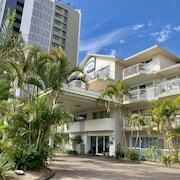 The Miami Beachside Holiday Apartments and Burleigh Surf Apartments are two fantastic options. Improve your technique at Burleigh Golf Club, a great stop for golf nuts. The Turtle Beach Resort and Montana Palms Holiday Apartments are among the most sought-after hotels to check out around here. 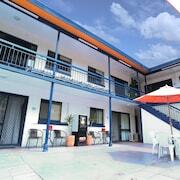 Want a room in Miami but don't want to burn through all your savings? Take a look at the disgustingly good rates at the Ocean Beach Tourist Park. You'll want to get in quick though, as there are only a few cheap hotels here. There isn't anything wrong with spending a little extra on holiday. Let 'future' you deal with the bank balance while 'holiday' you gets acquainted with the fluffy bathrobes. 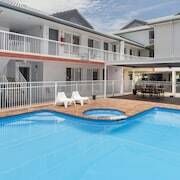 The Nobby Beach Holiday Village is lastminute.com.au's upmarket choice. Partial to a few drinks and a late night? Or is the cafe scene more your cup of tea? Whatever sizzles your bacon, we've got your sorted. Those who feel like a glass of vino or a couple of beers should wait till wine o'clock then toddle on over to Burleigh Golf Club. If you wake up with a sore head, grab your sunnies and follow the aroma of roasting coffee beans to Gumtrees. 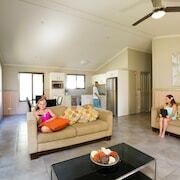 Why not chat to the gang about booking accommodations in Nobby Beach or Mermaid Beach when arranging your getaway? 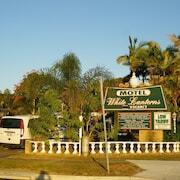 Nobby Beach is only 1 kilometre from Miami, and Mermaid Beach is about 2 kilometres away. So, in a few clicks you can shut down the laptop and begin packing your bag for an extraordinary Miami holiday. From hotels to flights, we're here to help every step of the way — just say the word!